So Mk is 50 today. It was a bold experiment – the first attempt in the UK to develop a whole New Town on a formal grid, backed by probably the most formidable consultancy team ever assembled in England. As someone who wrote there thesis on MK and does new town planning around the world understanding the strengths and weaknesses of MK is essential as a case study for every urban planner. By the 1960s the grid was back in fashion as an organising unit for urban planning. This was of course the age of Doxiadis with his plans for Islamamab & Riyadh. The concept was that of a multilayered grid across the whole city serving different sizes of community – it would expand overtime in linear corridors with the lowest level of community roughly corresponding to the Clarence Perry Neighbourhood Unit. This was clearly influential on Forrestor, Weeks and Bor in the Masterplan for MK. It has served the city well. The fundamental extend-ability of the Grid, as emphasized in the work of the Lincoln Land Institute on high growth cities has served it well. Much has been written about the influence of Melvin Webber and the ‘non place urban realm’ where people would zip by car from place to place and where traditional communities would not matter. I think this has been overestimated. It certainly contributed to a neglect of public transport networks but no more than anywhere else planned in the 60s and 70s. 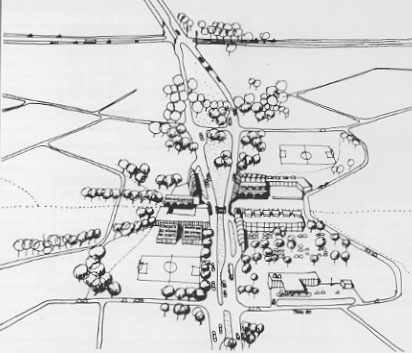 Milton Keyne’s masterplanning was clearly dominated by its thinking about propinquity and the neighbourhood unit. This was most evident of the ‘man in black’ Francis Tibbalds who was tasked with solving the fundamental dilemma of the Perry Type neighborhood Unit, by placing services at their centres their edges became desiccated of people with roads acting as barriers between internally well connected neighbourhoods poorly connected to surrounding neighbourhoods. As is well documented by Micheal Edwards who was part of that team Tibbald’s solution was brilliant and so well drawn it was presented straight to the development corporation board. Rather than connector roads as barriers neighbourhood centres would be built around their intersections and traffic would be slowed at these centres. The traffic engineers resisted it however and the concept was undermined by a Green Grid which created mounds and tree lined barriers along the main roads. It is something of an urban design dogma that rod grids, people grids and green grids should always align, where they separate and interact are almost always the interesting places in any city. What should have happened would have been for the green grid to separate and interpenetrate the neighbourhoods. Tibbalds was ahead of his time, Link-Place-Node thinking now emphasises that the speed and function of a road can vary along its length. Planning a city of grid blocks looking inwards is so easy it is the predominant form of urban planning around the world, characterised by the Chinese Superblock and its soviet equivalent the ‘microdistrict’, and the horrific monotony of design it produces with similar to MK but at far higher densities, especially when combined with a Gropius like obsession with slab blocks over perimeter blocks. As soon as cities vary in density and land use within a neighbourhood unit they must vary in size to accommodate the varying catchments of its services. Now we can use parametric and GIS based techniques to model this precisely. A grid block doesnt need major collector roads on all sides – that provides too much road capacity. The priority for cities of MK size and above should be too develop linear growth corridors served by BRT with high density nodes along them. Grids should be more informal with their basic ordering unit being small superblocks/Perimeter blocks forming clusters inside which traffic should be discouraged. The dogma that all neighbourhoods should be challenged, in many cases it will be driven by local drainage patterns/topography so that sponge city/green infra networks dictate neighborhood shape. 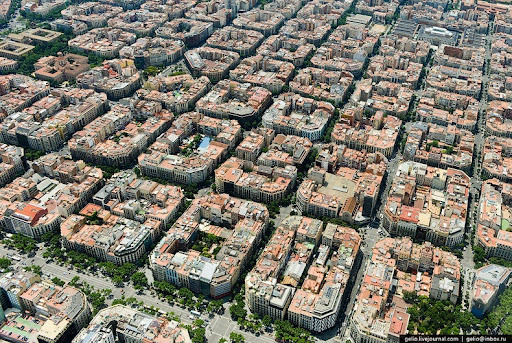 Also square blocks are inefficient compared to slightly rectangular ones, that enables much greater cariation of local open space/street/place form as tesselations interact and intersect. Hexangonal grids, if you can provide them, are also far more efficient in terms of infrastructure provision. A winning competition entry from 2010 in Moscow where all of the entrants had very similar thinking about grid form – which shows there a trend going on. The block is made up of plots. When a plot development is demolished, the block and the public spaces round it remain. The block is a key constituent of the city’s continuity, and the common experience, through time, which it affords. The block is not a single building, one reason why the urban progressiveness of development of the kind showcased at Kings Cross in London is retrograde.